opening party of Eden Fine Art’s newest gallery. 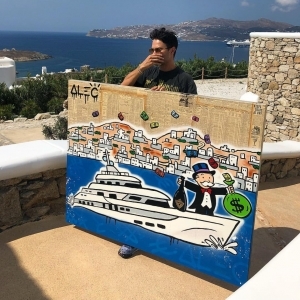 Alec Monopoly has sailed across the Aegean Sea to the Greek Isles as part of the launch of Eden Fine Art’s new gallery on the luxury Mykonos island for his exhibition ‘MONOPOLY I$LAND’. 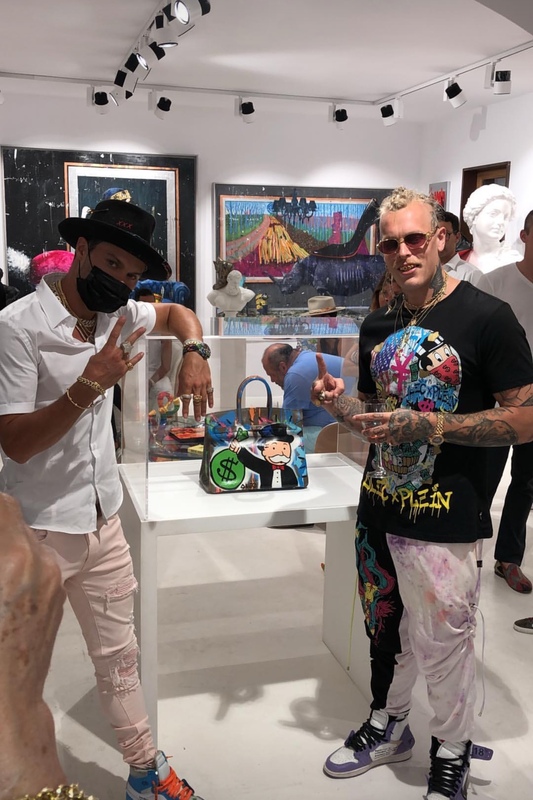 The event introduced Alec’s original collection and guests were also encouraged to explore the artist’s newest artworks in an exclusive exhibition at the brand-new boutique gallery. Born as Alec Andon in 1986 to wealthy financiers, the celebrity graffiti artist known professionally as Alec Monopoly is originally from New York City. Monopoly began his artistic career making graffiti around the city. “Painting on walls is more fun for me because it’s exposed to everybody, not just art collectors or enthusiasts,” he has said. Monopoly is best known for his moniker which is derived from the Monopoly board game’s tuxedoes and top-hatted Rich Uncle Pennybags. The artist has worked in the urban environments of New York, Miami, Los Angeles, Europe, Mexico and Asia, using varied materials (including stencils, spray paint, epoxies, varnishes and newspapers) to subversively depict various iconic pop culture characters. Monopoly is a brand ambassador, or the “Art Provocateur,” for Swiss watchmaker TAG Heuer. He creates original artworks for the brand and has been transforming the TAG Heuer boutiques into art galleries, something that has never been done before. He has said that it has been a lifelong dream to design his own watch and have his artwork on the dial of a watch – a dream which is to be realised in his soon to be released TAG Heuer watch. Monopoly’s work has been purchased by the likes of Phillip Plein, Miley Cyrus, Robin Thicke, Snoop Dogg, Seth Rogen, Adrien Brody and Iggy Azalea. He also created a mural live, on red carpet for Justin Beiber’s 2013 film, Believe. Although graffiti continues to be conveyed as a crime, in his recent feature in Juxtapoz Magazine, the artist spoke about his efforts to avoid the vandalism aspect of the street art world. Known for wearing a top hat and bandana or trademark ‘Alec Monopoly’ hand gesture to cover his face, the now L.A.-based graffiti artist Alec Monopoly routinely keeps his identity hidden for a number of reasons. Initially it was for legal reasons because his lawyer advised him to stay anonymous due to the fact that he was wanted by the police in New York. 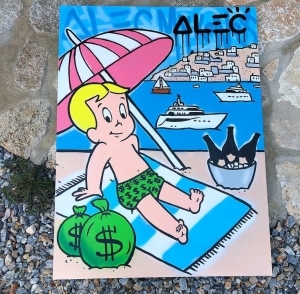 Then as he became more mainstream, people started making the ‘Alec Monopoly’ hand gesture so it became ‘a trendy thing’ according to Alec, who also believes that keeping his identity secret means that people focus more on his artwork than on who he is as a person. 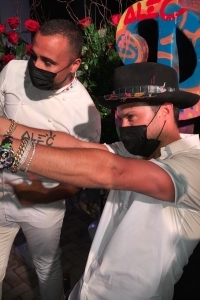 A long way from being wanted for arrest by the police in New York, Alec Monopoly is now one of the most sought-after street artists in the art world. London, and San Francisco plus numerous additional cities across the world. 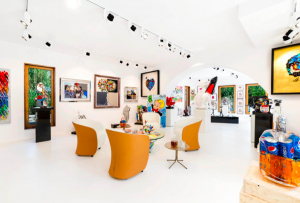 The boutique gallery in the beach town of Nammos Village, is Eden Fine Art’s newest, bringing its bringing its colourful, contemporary collection all the way to Mykonos. At Eden Fine Art Mykonos you will find internationally renowned artworks just seconds from one of the world’s most glamorous seaside locations. 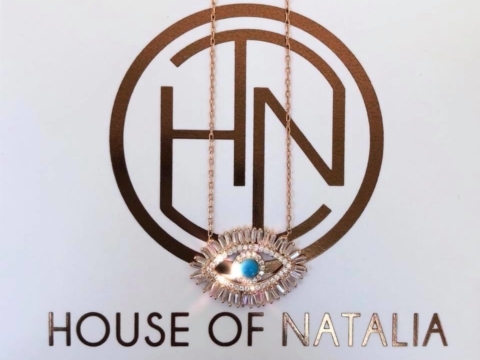 Eden Fine Art favourites such as Alec Monopoly, David Kracov, Dorit Levinstein, SN, Jonas Leriche and many more. Contemporary art has never looked so good with this newest gallery offering a sculpture garden where its artists’ three-dimensional pieces are showcased. According to Eden Fine Art Gallery, it is here that the Mediterranean sun, shining almost every day of the year, picks up vivid, sensual textures of Angelo Accardi’s surrealist pop-sculpture, highlights the vibrant painted bronze and aluminium of Dorit Levinstein’s famous figurines, and reflects off Alec Monopoly’s high chromium polyester sculptures, featuring favourites like the famous Richie Rich and Mr. Monopoly.